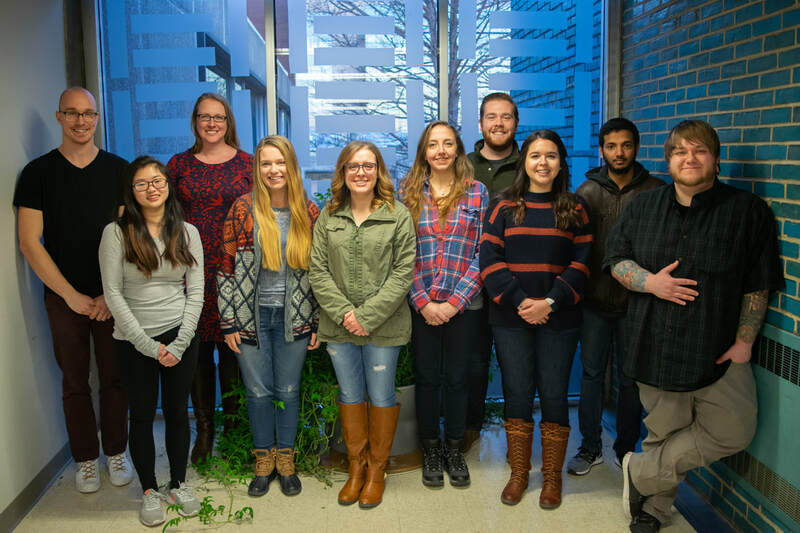 The Willets lab is interested in understanding how heterogeneity at nanoscale interfaces impacts the function and properties of materials. Much of our research focuses on noble metal nanoparticles, typically gold and silver, which are both optically-active through the excitation of localized surface plasmons as well as electrochemically-active, which enables them to behave as nanoscale electrodes. We use a variety of techniques including fluorescence, Raman, single molecule imaging, super-resolution imaging, electron microscopy, atomic force microscopy, and electrochemistry to understand how nanoscale interfacial heterogeneity affects a range of applications including sensing, energy harvesting and transfer, and surface reactivity. Visit our research and publication pages to learn more. April 17, 2019. Spencer receives the the Richard Asher Paclin Memorial Award and Jen receives the Abraham and Ruth Clearfield Scholarship. Congratulations to our undergrads! March 6, 2019. Jet and Taryn's collaborative paper with David Masiello's group on surface ligand reorganization due to plasmon-induced heating is accepted at J. Phys. Chem. Lett. February 26, 2019. Yun's collaborative paper with Xiaoxing Xi's group on measuring the energy distribution of plasmon-generated hot holes is accepted in ACS Nano. February 25, 2019. The Willets lab bids farewell to our first Temple Ph.D. student, Vignesh, as he heads to a postdoc with Paul Bohn at Notre Dame. Best of luck Vignesh! January 25, 2019. The Willets lab bids farewell to Yun Yu, as he moves on to a postdoc at UC Berkeley. Good luck Yun and thanks for all of your hard work! January 2, 2019. The Willets lab welcomes a new undergraduate researcher, Jen Luu! December 14, 2018. Our updated chapter on SERS is published in the second edition of the Handbook of Organic Materials for Electronic and Photonic Devices. December 5, 2018. The Willets lab welcomes two new first year students, Abby Crawford and Bianca Paranzino! December 4, 2018. Vignesh receives the Francis Case Fellowship Award in recognition of his outstanding research. Congratulations Vignesh! November 20, 2018. Vignesh successfully defends his Ph.D. Congratulations Dr. Sundaresan! November 5, 2018. Our collaborative paper with the Dobereiner lab on arylpyrrole functionalized polymers is accepted in Macromolecules. October 30, 2018. The Willets lab visits Freire Charter School to run our annual Adventures in Silver activity. October 4, 2018. Kallie's review on the role of SERS in electrochemistry is accepted in Current Opinion in Electrochemistry. September 28, 2018. Bonnie and Spencer participate in the Undergraduate Research Program poster session. Congratulations on your excellent posters! July 30, 2018. The Willets lab has a postdoc research opportunity on using super-resolution imaging to study coupling between plasmonic nanoparticles and molecular emitters. Click here for details. July 16, 2018. Vig and Joe's paper on monitoring multiple simultaneous electrochemical reactions is accepted at ChemElectroChem as part of a special issue on Single Entity Electrochemistry. July 11, 2018. Our NSF proposal on "Super-resolution imaging of plasmon-molecule interactions" has been recommended for funding! July 1, 2018. The Willets lab says farewell to Padmanabh, Aaron, and Alli. Thanks for all of your hard work and good luck with everything!